I think it sounds pretty crazy. Mountaineer Buc wrote: Outside of competition and innovation and wealth which you just described, what are the other ideals about America that you love and serve as the justification of why others around the world want to live here? You say "socialism" is antithetical to these things, but perhaps the discussion would be better served if we clarify what those things are. Opportunity, individual liberty, individual self-determination. These are ideals that are not synonymous with Socialism past or present. Opportunity: Opportunity to do what? Individual Liberty: Liberty to do what? Individual self-determination: Is this with or without limits? I feel like people always ignore your Q&A setup. Mountaineer Buc wrote: Okay, let's break this down a bit. Well, one thing Dread and I have in common is that we're both capitalists and what he's saying here isn't outrageous or radical, but when we can't get terminology right, we have to come to a basic understanding of what we're talking about. to do otherwise is to simply throw nonsensical partisan attacks at each other. And that's gotten quite boring. Stuart wrote: let em all censor. FB and twitter are left leaning playgrounds. I've seen alot of this talking point where Alex Jones is harassing Sandy Hook families, or like you posted encouraging his followers to do so. This is from the article you posted. Where does Jones specifically "urges his followers to harass grieving parents of kids"? Ima kinda torn on this Infowars/censorship saga. I certainly don't like it for more reasons that I'd support it. Platforms like YT have monopolized video sharing so if they start to censor arbitrarily they leave themselves open to government regulation, which I don't like either. I think twitter has it right on this issue. Establish a ToS and if users violate them they are punished iaw those ToS. That should be applied equally to all users (regardless of follower count or political leanings) by all social platforms imo. DreadNaught wrote: Where does Jones specifically "urges his followers to harass grieving parents of kids"? The guy is a piece of ****, I don't listen to him and can't give specifics, but what other reason would you have for trying to make the addresses of the parents public? As far as your second line I quoted, do you agree with the suspension of the "antifa suspersoldier"? He is a POS, but according to their TOS, he hasn't done anything worthy of being suspended. The ANTIFA post you posted, the individual clearly calls for direct violence. It seems you weren't following yesterday, but I'm not a fan of Jones and I support YT censoring their content as a company, but I don't agree with their seemingly limited scope in censoring. My, "Good" was because Twitter is putting a statement out there and they are promising to stand by it and not have people randomly banned like Candace Owens was. Twitter is stating they aren't banning people because they don't like their views or if they are a POS, but the individual needs to violate their set ToS first. uscbucsfan wrote: The ANTIFA post you posted, the individual clearly calls for direct violence. You think that's a call for violence? Explains why the bots are so successful. 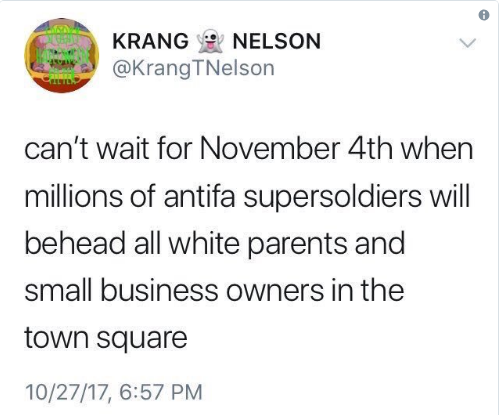 I'm sure Nov 4th will still be successful for you. So according to that link it was his lawyer that made the heinous suggestion during litigation with lawyers for the plaintiff (representing the Sandy Hook family). That is obviously a distasteful tactic, but I figured there would type of video or post from Jones where he was "urging his followers to harass grieving parents" rather than parsing something his lawyer said. Maybe there is something else out there b/c I've seen this talking point a few times now but haven't found the source/citation where Jones did that. In regards to your other question, I'd say it could be construed as inciting violence which probably violated the ToS. Like I stated, I support these platforms establishing and enforcing their ToS to all users equally which is why I think twitter got it right for the most part. It's up to users to understand the ToS and abide by them. 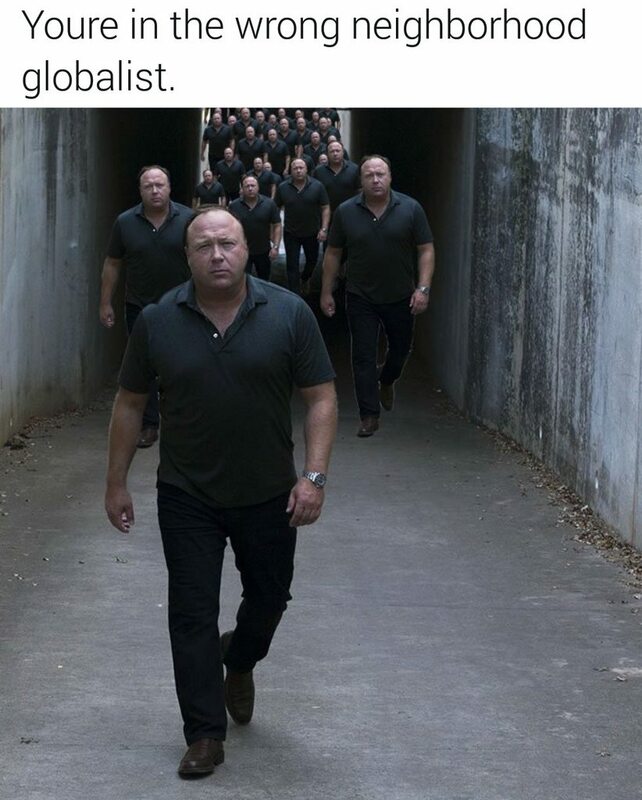 Alex Jones is one of my least favorite people on Earth. After flat earthers and dino deniers 9/11 truthers are my least favorite group. Edit: pedophilia is a sexual orientation folks are there, too. I'm sure there are more. Last edited by uscbucsfan on Wed Aug 08, 2018 3:23 pm, edited 1 time in total. "See it's like the middle-upper class doesn't exist anymore. It like had its like heydey in the 90's when you had like soccer moms with like 2 minivans but that is not like America anymore." I'm paraphrasing but this is like how the actual new star of the Democrat party actually like speaks. Brazen331 wrote: "See it's like the middle-upper class doesn't exist anymore. It like had its like heydey in the 90's when you had like soccer moms with like 2 minivans but that is not like America anymore." I'm fairly sure this is actually code for, "Lawmakers shouldn't concern themselves with white middle class types anymore." I'm honestly surprised she had the intellectual restraint not to throw "white" into that sentence. Mountaineer Buc wrote: Pretty cool, huh? You have her mistaken for Maxine Waters. Respectfully, MB, I don't begrudge you your desire to annoint a champion for alternative political representation in government. I share it, though in different ways. I just don't think this young lady is the droid you're looking for. She's really, really dumb. Every interview, no matter how soft the tosses, she sounds like Dubya trying to win Ben Stein's money. Don't get me wrong, I'm not complaining. An articulate socialist can actually make the philosophy sound reasonable to some people. I'm perfectly happy with this living Tumblr account trying and failing to do it. But if I were you, I'd cast my die elsewhere. Mountaineer Buc wrote: You have her mistaken for Maxine Waters. I already know that policywonks like us are gonna be unmoved by her young kid diction, but the fact remains that you are putting too much stock in the American voter who thinks a guy like George Will is stuffy, boring, old guy while Donald Trump "tells it like it is." The right is overrun with mouthbreathers. Tend your own garden. Placeholder for rebuttal when I haven’t had too many adult beverages. Mountaineer Buc wrote: You nailed it. She's our Joe the plumber...except that she won. Joe the Plumber? She is your Sarah Palin. And how many soccer moms have 2 vans anyway? I thought the point in buying a van was that you don’t have to buy another one. Well, as you know I'm not of the right, at least not anymore. The closest thing I have to representation in Washington is Rand Paul, and I disagree with him about 40% of the time. But I understand your point. I wouldn't take this piece of advise from a Trump supporter. But you can take it from someone who wants less dumb in politics. Capitalism is on life support boys. Whatever manifestation people think it has taken on these days is not the same relationship we saw in the American economy of 60 years ago. The only part of the definition today's capitalism lives up to is that it is business for the profits of individuals and not the state. My grandfather raised 5 children over roughly 25 years on his union trucker salary in Pontiac Michigan delivering GM cars around America from the plant and a night time security job in Tampa while my grandmother stayed home. Now in some places it takes 2 salaries to even raise a single child and in 25 years my grandfather's job may no longer exist anymore because cars will drive themselves and more security features will be developed to where we no longer need people. What the actual **** did the American worker do wrong over that period of time to deserve such a fate? This business worship crap needs to stop. They're screwing us and we're smiling while they do it. Each case is specific. Each case is different. Not everything is fucked for everyone. But it's happened often enough that it's beginning to lead to generational disenfranchisement and the ideas of socialism is taking root. Our children know better, they're the most educated group in history. But if the current trend continues for about another 10 to 20 years it's gonna get to the point where we can't blame them anymore for wanting gravitate to something so different when all they have to do is look towards their European cohorts who pay $200 a year for university like Cheb's sister-in-law or nieces, nephews (whatever it was) in Germany while Americans continue to try and fail the old fashioned way.